& take “La Vaquera” home for free! 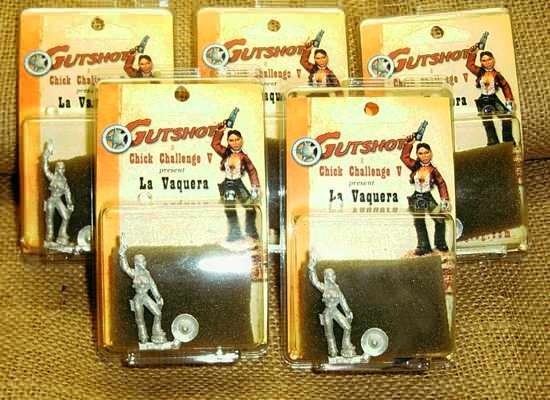 To celebrate the one-year anniversary of Gutshot’s premier at OwlCon last year, this year Hawgleg Publishing has teamed up with the Chick Challenge V painting contest to bring the limited-edition “La Vaquera” miniature to this year’s convention. And she’s FREE to everyone who buys a copy of the Gutshot Core Rule Book at the convention. Jason Moses commissioned this miniature last year for his Chick Challenge V painting contest (note the CCV initials on the bottle). The contest has been a pet project of Jason’s for the past five years and has grown to where it now draws some of the best painters from around the world. Bobby Jackson, based on Jason’s initial ideas, created the sculpture, which is sold through the CCV Website. "My first thought when I received the sculpt was "THAT'S a big gun", followed closely by "Now there's a girl who swallows (the worm),” Jason said. “At Hawgleg, we really took a shine to this lethal lady, so we asked Jason for permission to buy a few and package 'em up for giveaway (and sale) exclusively at this conventions. He agreed, and for that we're plum grateful!” Mitchell said. This is a very limited run miniature, with less than 80 left in stock. Since Jason didn’t want to deplete his entire stash, he agreed to sell 24 to Hawgleg for this promotion. Since the book itself sells for only $20 (including tax), this is a very sweet deal! For those people interested only in the miniature, she can be purchased separately for only $5. In addition to offering La Vaquera free with each purchase (while supplies last), Hawgleg’s busted open the safe at the Well’s Fargo office and set up a few prizes that are guaranteed ta put a smile on your face and a spring in yer step. The Texas-Sized Prize includes danged near everything but the kitchen sink,” Mitchell said with a grin. 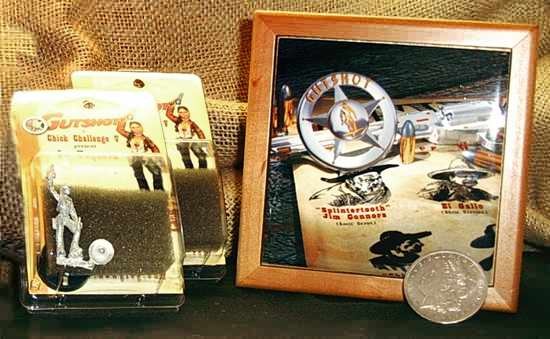 This year's mega-Western prize package will include a limited-edition La Vaquera miniature, a Gutshot Tile Box, and an authentic 1889 Morgan Silver Dollar. The prize bundle will also include a copy of the Gutshot Core Rule Book, a Whitewash City starter CD, and a Larry Leadhead book (not pictured). The Morgan Silver Dollar was donated by Gutshot Posse member Paul Mauer. “I just thought it’d be cool,” Paul said with his characteristic modesty. “It’s a beautiful coin and I think anyone interested in this time period would really enjoy having it." 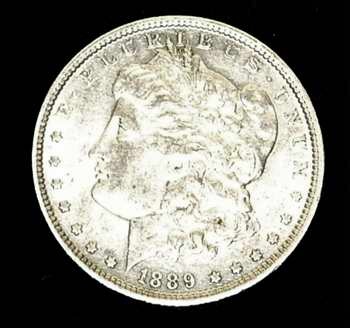 This coin is referred to it as the Morgan Silver Dollar after its famous designer, George T. Morgan. Most of the coins were minted in the USA between 1878 and 1904. Gutshot co-creator Mike Murphy agreed. Actual photo of the coin we'll be giving away at OwlCon XXV. The second and third prize content will include a few choice miniatures and other gaming swag, including Larry Leadhead books and Whitewash City CDs. Prize winners will be selected from the names of people who register at the Hawgleg table in the dealer room. No purchase is necessary, and you need not be present to win. The drawing will be held Saturday sometime around 6:30 p.m. (or whenever Mitchell finishes the game he’s scheduled to run at that time). OwlCon is the longest running gaming convention in Houston. It runs Friday through Sunday, Feb. 10-12 at Rice University in Houston, Texas. For more info, please visit their Website: www.owlcon.com.